From Dear Evan Hansen, now at the Music Box. The big problem in writing great musicals is not the difficulty of writing great songs. The big problem is that the songs, great or not, are cannibals, picking the stories clean and leaving a pile of bones. It’s a zero-sum system. In musical dramas the problem is even worse, as innumerable failed adaptations of huge 18th-century novels have proved. (They often seem like CliffsNotes of CliffsNotes.) But when a musical drama clicks, an amazing fusion event occurs: The songs and the story enlarge each other in the process of becoming inseparable. Think of Sweeney Todd or, more intimately, Fun Home. 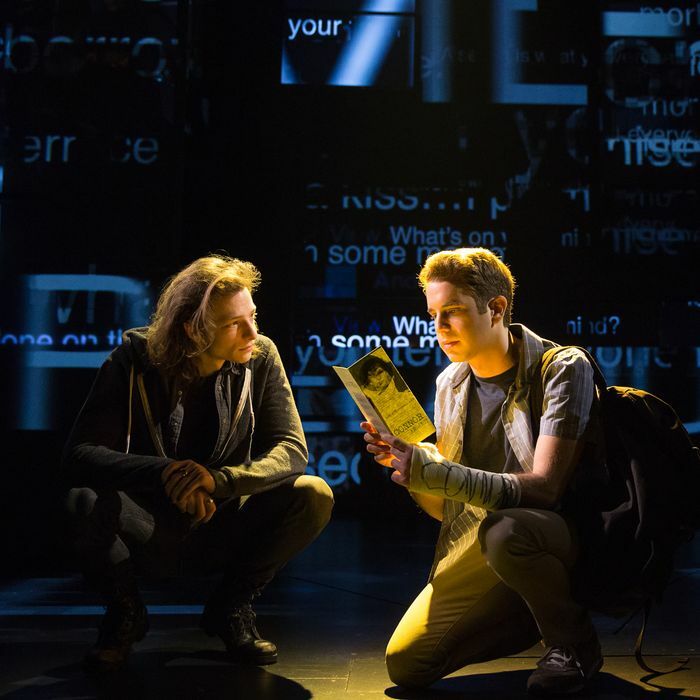 And now add to the list Dear Evan Hansen, which opened tonight in a production beautifully directed by Michael Greif. I called the Off Broadway production at Second Stage this May “the feel-anxious musical of the season.” But it is even better on Broadway, so fine in its craft and rich in its gathering of themes that, like the best works of any genre, it rewards being seen again — and again. The improvement is somewhat mysterious because so little has changed. None of the songs by Benj Pasek and Justin Paul have been cut and none added. One supporting role has been recast. A slight fine-tuning of the opening sets up the social situation more clearly and a few bits of added dialogue clarify plot points that were muddy in May. I won’t go into detail about that plot; one of the immense pleasures of Steven Levenson’s book for the musical is that he keeps inevitability and surprise in such constant tension. But in brief, it’s the story, based on an incident from Pasek’s youth, of a 17-year-old high-school senior who suffers from severe social anxiety. When a downcast letter he has written to himself is stolen and winds up in the wrong hands, he lands in the middle of a family’s grief over the death of their son and a social-media storm that exploits it. The social-media part of the story is not an overlay but the central milieu. (The stage is dominated by Peter Nigrini’s projections of Facebook and Twitter feeds, Nevin Steinberg’s sound by a cantata of notification dings and beeps.) Beyond the design, the musical sees social media as an external expression of Evan’s social anxiety; both are distortions of normal interaction. One kind is too easy, the other too hard. This allows us to sympathize with or even endorse behavior we might otherwise quickly condemn, as when Evan, altered by people’s newfound interest in him, infiltrates himself into the grieving family’s home and into the affections of their 16-year-old daughter. We are almost glad for the lies that allow him this access because we have seen how lonely his condition has made him. “Step outta the sun if you keep getting burned,” goes one of his lyrics from “Waving Through a Window,” which any minute will become the national anthem for bullied kids. Even so, the boneheadedness of some of Evan’s choices would make him untenable as the lead in a less skillful musical, and might do so here as well were it not for the star-making performance of Ben Platt in the role. Platt, who is 23, imbues the character with so much pathos and lively detail that he succeeds as the story’s engine despite being almost pathologically passive. And oh what a symphony of tics he has orchestrated! His sentences seem to die of embarrassment on their way out. His right hand operates independently from his body, as if it were the only confident part of him. (He sometimes talks into it, too, as if it were an ear.) Plucking at a cast where it touches his skin, he echoes the cringe induced when his mother tries to buck him up with an optimistic catchphrase or a chuck on the shoulder. That he does all this while also tracing the enormous arc of the character’s through-line, and singing beautifully through many ugly tears, makes the achievement even more astonishing. I would think it would be impossible not to care deeply about his Evan, or at least not to want to give him a hankie. And I did, and I do, and I will. But it will be hard not to care about any of the characters, even the undermining frenemy who digs Evan deeper into his lies and the go-getter who rides his hashtag coattails. Greif’s careful balancing of the material never lets their main function as sources of amplification and humor capsize their humanity. That Levenson has been able to find spots for humor at all in this grippingly sad story, and that Pasek and Paul have been able to turn those opportunities into songs of comic relief (or at least comic discomfort) is a sign of the size of the ideas in play. These include class and cruelty, teen suicide and the medicalization of unhappiness, lying as a gift and lying as theft. But the big idea, the one that ultimately justifies the show’s transfer to a theater that seats 1,000 from a theater that seats 300, is the breakdown in the meaningfulness of communication that has accompanied such massive improvements in its means. In Dear Evan Hansen, we see that dark paradox played out to a devastating conclusion, a conclusion we have now reached in real life too. Nothing on social media is true, the show demonstrates; we are all fake news. How could that not be the case when we have not even learned to speak honestly — except perhaps in the theater — about the truest, most difficult things? Dear Evan Hansen is at the Music Box Theatre.